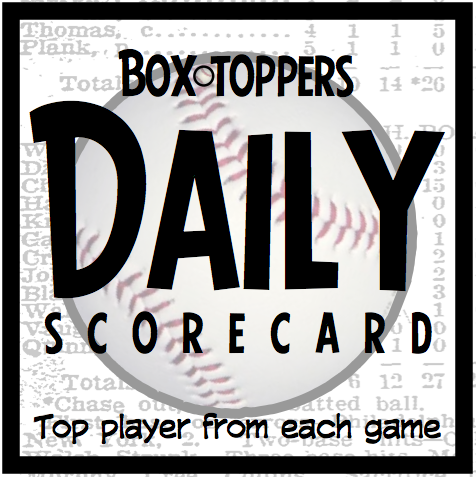 Nationals pitcher Dan Haren is Wednesday's Player of the Day, while Tigers pitcher Anibal Sanchez rises to 10th place in Box-Toppers player rankings. Haren pitched six scoreless innings, giving up only one hit and striking out eight, in the 3-0 win over the Mets. Sanchez, American League Player of the Day, rises to 10th on the season's Box-Toppers player rankings (see the top 10 player list on the home page). Sanchez pitched 7 1/3 shutout innings and struck out 10 in the 1-0 win over the White Sox. He earns 1.7 Box-Toppers points for being AL Player of the Day, giving him 16.1 for the season. Mike Carp of the Red Sox is AL Batter of the Day. Carp hit a pinch-hit grand slam in the top of the 10th inning to beat the Rays, 7-3. Jack Hannahan of the Reds is National League Batter of the Day. Hannahan homered and drove in three runs in the 6-0 win over the Cubs. Cardinals pitcher Lance Lynn rises to 17th place. He earns 1.0 Box-Toppers point for being Player of the Game (6IP 0ER 10K ND in 5-1 win vs. Brewers), giving him 14.1 for the season. Paul Goldschmidt of the Diamondbacks rises to 26th place and remains the top-ranked NL batter. He earns 1.0 Box-Toppers point for being Player of the Game (4-5 2RBI in 4-1 win vs. Dodgers), giving him 12.7 for the season. Robinson Cano of the Yankees rises to 27th place. He earns 1.0 Box-Toppers point for being Player of the Game (HR 2-4 2RBI in 5-4 win vs. Orioles), giving him 12.5 for the season. Phillies pitcher Cliff Lee rises to 28th place. He earns 1.0 Box-Toppers point for being Player of the Game (8IP 9K W in 4-2 win vs. Padres), giving him 12.4 for the season. Haren receives 2.0 Box-Toppers points for being Player of the Day. Sanchez receives 1.7 for AL Player of the Day. Carp and Hannahan each receive 1.5 for being top Batter of the Day in their league.